Sited on the far wall as you enter Gallery 3 is a large oil painting by George Frederic Watts considered to be one of England’s greatest Victorian painters. 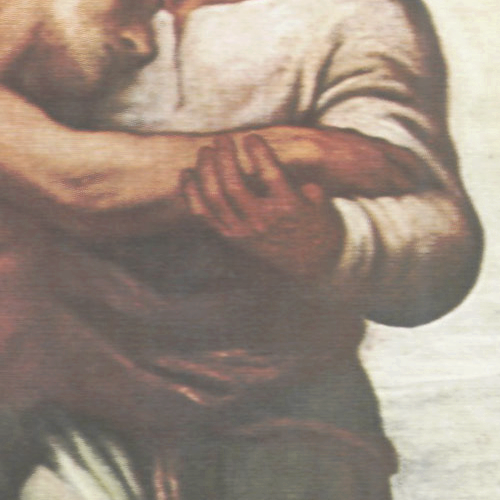 The Good Samaritan portrays the tender moment when a traveller offers support and care to the broken body of a stranger he finds wounded on the roadside. Full of compassion and gentleness the soft muted colours and careful brushstrokes capture the strong embrace of this anonymous rescuer as he carries the vulnerable figure to a place of safety and refuge. Despite his broken posture, the naked body of the Jew bears no wounds or bruising. His face, resting upon a strong shoulder, is pale and slightly blue in comparison to that of his rescuer who has a darker, more tawny complexion – possibly due to his labouring outdoors in the fields. A donkey, rather than a nobleman’s horse stands on the right of the painting offering us clues to the apparent poverty of the Samaritan man. Also notice the frayed and tasseled red cloth around the animal’s face reminding us of the red fabric traditionally tied to the horns of the scapegoat offered as a sacrifice in Jewish culture. 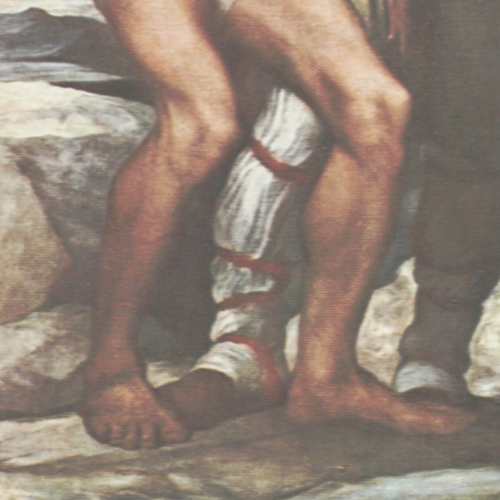 This red cloth is then repeated on both the wounded Jew and the Good Samaritan wrapped around both legs and waist as if the storyteller wants us to know that the Samaritan had perhaps torn away some of his own garment in order to cover his patients modesty. Robbed of his clothes and belongings the wounded man had been left to die on a road known for its dangers. The Bible story tells us that the rich and religious had moved past quickly ignoring his groans for help, fearful of getting involved in someone else’s troubles, but the kindly Samaritan took pity on the man who was actually his enemy, and putting aside all prejudice chose instead to see the weakness they held in common and to respond with love and compassion. GF Watts himself, moved by the great poverty he witnessed in the streets of London, expressed, with great empathy and skill, social concern through his symbolic and allegorical scenes of the lives he saw around him . 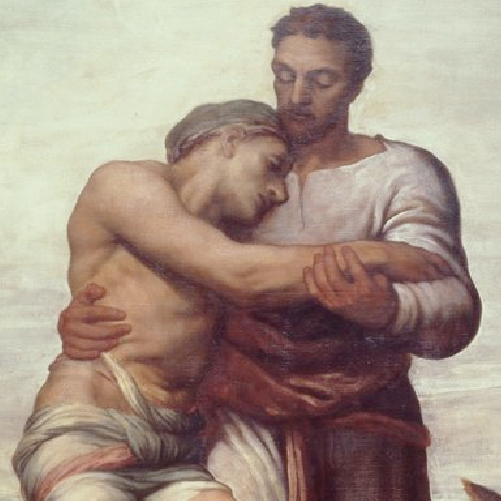 Inspired by the writings and work of Manchester’s prison philanthropist Thomas Wright he presented the painting of The Good Samaritan to The Corporation of Manchester in 1852.